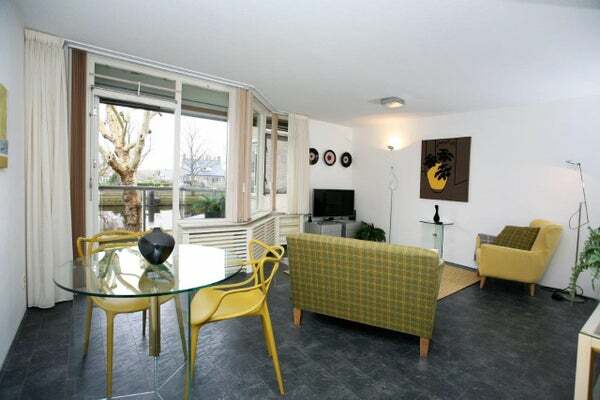 Lovely fully furnished 1 bedroom apartment in Voorburg with private parking and an amazing open view over the canal "The Vliet"
This apartment is located alongside the beautiful canal called The Vliet. It is 10 minutes biking to the lovely center of Voorburg with a variety of shops and restaurants. By car you reach the highway to Amsterdam and Rotterdam within 5 minutes. Good public transport connections. By tram to the Central Station of The Hague takes you just 15 minutes. Lay-out: main entrance, lift to 1st floor, entrance apartment, hall, bright open plan living/dining room with a lovely balcony overlooking the canal "The Vliet". Modern and well equipped semi-open kitchen, good sized master bedroom with beautiful large built-in closets, bathroom with shower, washbasin, washer and dryer and toilet.